Human activity cannot grow forever on this finite planet, yet our present economic system requires perpetual expansion. It is critical that we change our cultural/economic goal. We need to develop secure and satisfying ways to live within planetary limits. This shift is taking place as the conventional wisdom changes. What the change involves, and how shifting the conventional wisdom can produce results on a scale comparable to the challenges we face are the topic of the short audio track here. It is a Question of Direction. The question is whether the top priority in decision-making should be continuous material expansion or respect for planetary limits? If we present this basic choice every time related issues arise, the question will become like a drum beat. It will pick up resonance with each person who grasps it's meaning until it is so loud and so clear that the new goal becomes the new legitimacy. Presently, most people know the choice and they know the answer, but they don't necessarily know that they know. The situation quickly becomes conscious, however, when the dots are connected between our full planet and problems with diminishing natural resources, pollution and economic instability. There is no doubt that the conventional wisdom will change. No amount of public relations or technical fixes can perpetuate the system that has grown humankind from insignificance to a size where we affect everything on Earth. It took thousands of doublings in our activity to bring us to our present size. We fill the planet now. Another doubling would require a wholeaditional planet. For the economic system that brought us to this point to be healthy it must grow by at least 3% a year. Such a rate doubles activity in 24 years - one generation. The reason the present system is compelled to grow is explained in sound-bite #1.7 at: in our audio files. It is introduced by #1.6 on the same page. Problems arising from wanting more than the planet offers will become ever more obvious, leading ever more people to acknowledging the need for change. How soon the new goal becomes the conventional wisdom will determine whether we will be able to take the Internet into the future with us, or whether we will be lucky to find hand tools. The materials on this site aim to nurture this shift in conventional wisdom. 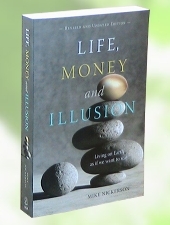 Life, Money and Illusion; Living on Earth as if we want to stay puts it all between the covers of one book. Some say we can continue to grow in non-material ways. While this is true to an extent, most efforts to date merely produce financial bubbles that are prone to collapse. Better results would come from giving more priority to education, preventative health care and entertainment. Such activities produce value with minimum material impacts. This and other approaches to a viable economy are explored in the essay Three Potent Steps to a Sane Economy near the top of our list of articles. The conventional wisdom is the way in which most of the population sees the world and what they understand to be legitimate behaviour. The conventional system has a problem. With annual global production around $60 trillion, the 3% growth considered minimum for economic health would, for this year alone, requires $1.8 trillion in new activity. This volume of new activity could cover all the food, water, shelter, education and health care needed by the world's poor - thirty times over. Not only is the project of eliminating human need far too small to solve the economic jugernaught's need for expansion, poor people have no money and therefore cannot help at all. "The impetus to reform . . . springs in every age from the realization of the contrast between the external order of society and the moral standards recognized as valid by the conscience or reason of the individual." The population is well advanced in understanding that a change in moral standards is necessary. Long-term well-being now requires minimizing our material impacts, enjoying what life offers and preserving the Earth for generations to come. Comparing this with growth for growth's sake, makes reform seem inherently reasonable. The requisite for transforming civilization exists in the contrast between the old goal of growth for growth's sake and the new goal. When the shift in legitimacy is complete, the creative abilities of billions of people will combine synergistically into a force comparable in scale to the challenges ahead. Long-term well-being will be an underlying criteria of every legitimate task that people take on. The more people who consider the options, the sooner the shift in conventional wisdom will take place. Ask your associates what they think. We provide simple materials to help introduce the topic.